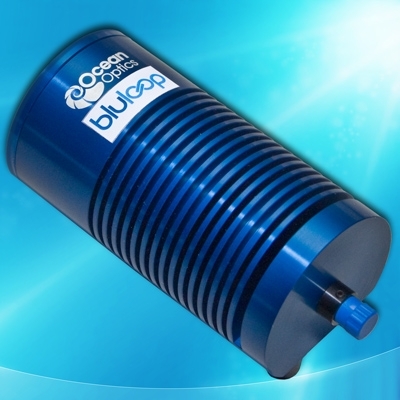 Dunedin, FL (February 29, 2012) – Ocean Optics’ BluLoop Light Source is a compact, LED-based source with balanced spectral output across the visible (400-700 nm) range. When coupled to a miniature spectrometer, optical fibers and sampling accessories, BluLoop is ideal for color and reflectance measurements and general-purpose VIS-NIR spectroscopy. BluLoop’s four LEDs are packaged in a rugged, small-footprint housing. Each LED is individually tunable for optimum balancing of the spectral output. Unlike tungsten halogen sources, BluLoop produces “flatter” spectral output in the visible range for more predictable response, especially for color analysis. In addition, BluLoop provides a more constant spectral distribution and strongly reduced instrumental stray light. Its power output is comparable to standard tungsten halogen sources.